Doosan is a South Korean conglomerate company. In 2009, the company was placed 471st in the Fortune Global 500. It has been included in the Forbes Global 2000 companies from 2007. Doosan is one of the largest heavy industries and infrastructure companies globally. Chaos has built a strong relationship with various business areas for over 5 years, helping them articulate what they stand for to their employees and gain cut through with some innovative internal comms campaigns. 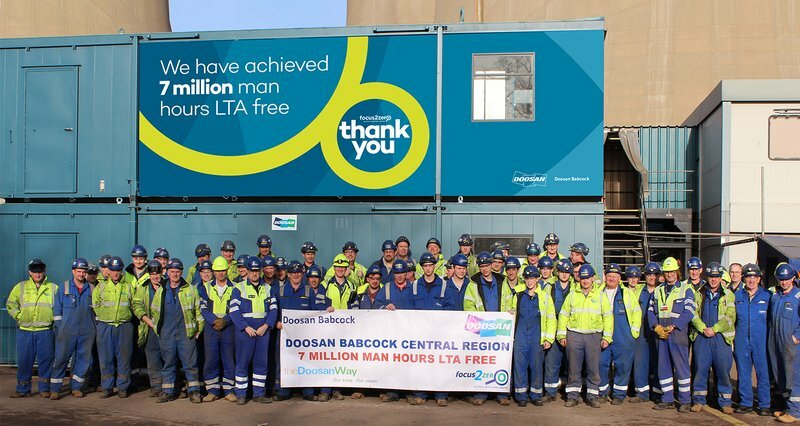 Successfully maintaining a focus on Health and Safety across Doosan's 3 main sites. Our focus was on emphasising the importance of health and safety at all available touchpoints. 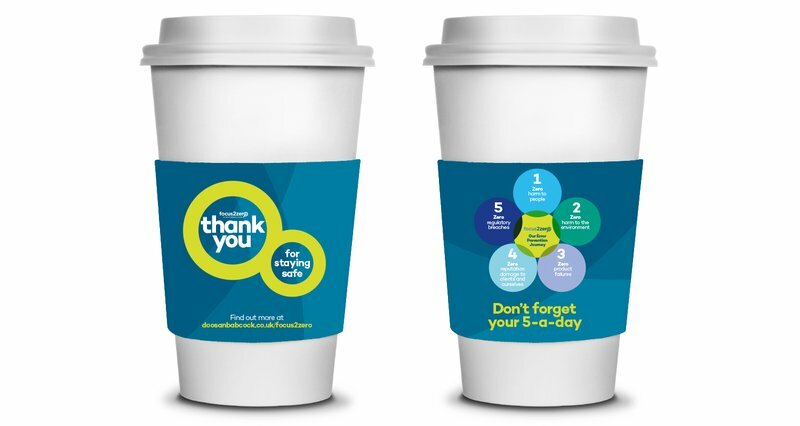 This meant we developed a vast range of elements including hand rail and mirror stickers, canteen tray sheets, cup sleeves, posters and even a portacabin wrap! Chaos successfully delivered a multichannel campaign to educate and motivate staff about their Corporate Social Responsibility (CSR). 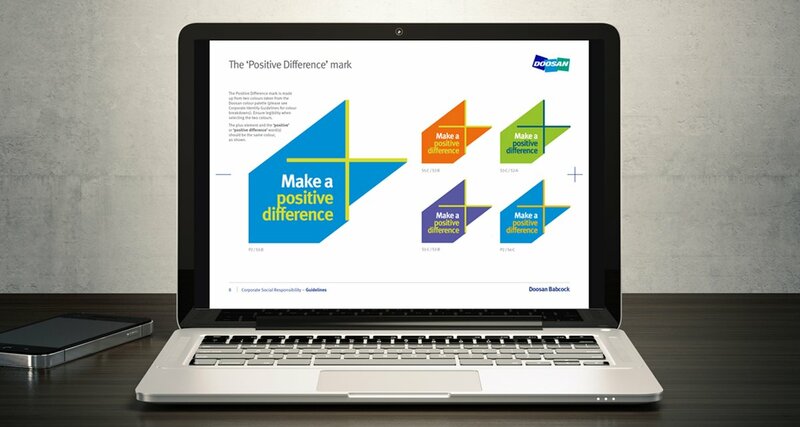 To reflect and showcase the benefit of personal CSR involvement, we created the concept of “Positive Difference”. 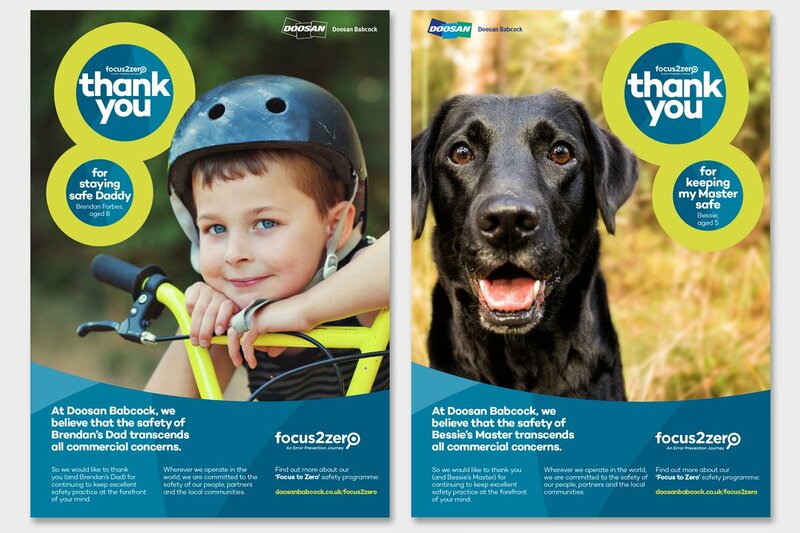 Having developed clear guidelines for implementing the new visual approach successfully, we delivered a series of campaign deliverables. These included an elegant Launch Pack with booklet and a belly band to capture hearts and minds and make employees part of the bigger picture at Doosan. Successfully delivered an internal Hearts and Minds campaign to unify 3 acquired companies - Doosan Babcock, Doosan Lentjes, and Doosan Skoda Power. Chaos recommended a template hearts & minds booklet, which could be adapted to see the bigger Doosan picture from the point of view of each of the 3 companies. 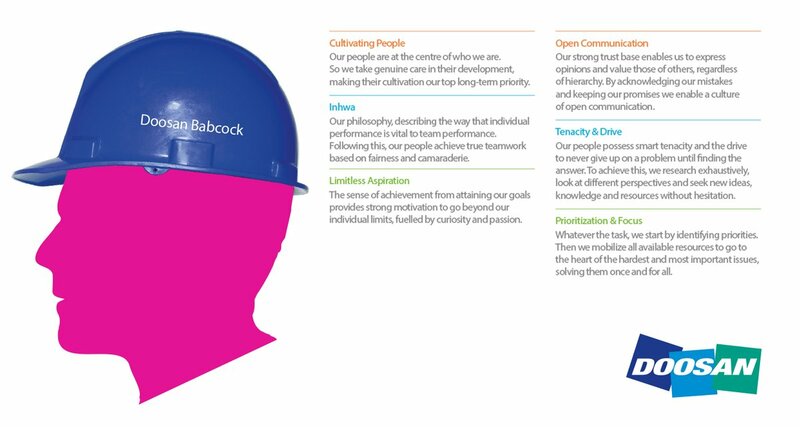 We then created a concept of cut-out hard hat profile heads to reveal the layers of the story about each company and its part in the bigger picture. Using infographics to bring key facts and figures to life, we delivered a dynamic, engaging piece that helped clarify a business structure that staff had struggled with. 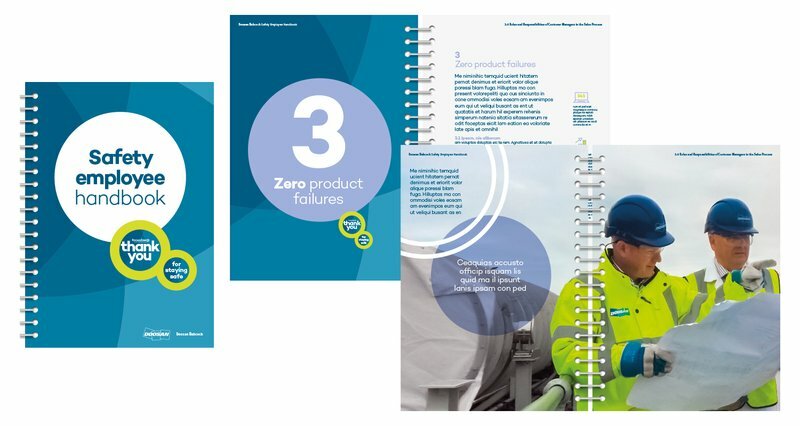 Unashamedly using the square blocks from the Doosan identity as inspiration to create graphic diagrams and information and image panels, Chaos has created a series brochureware from corporate brochures to product and service offerings literature and sales tools. 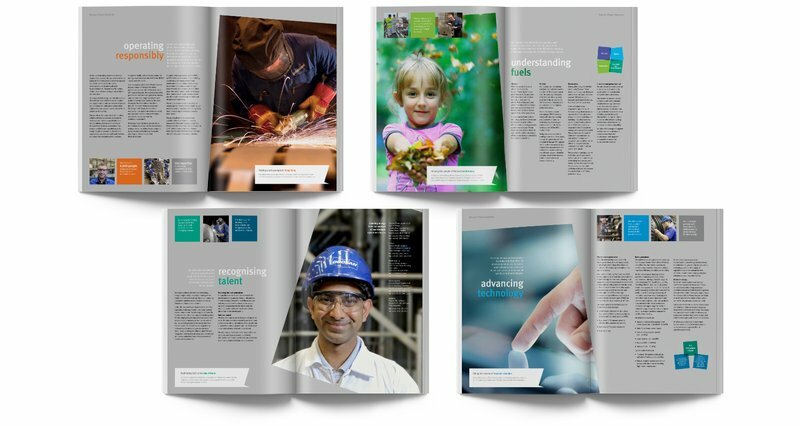 Chaos has helped create numerous brochures to support Doosan Heavy Industries, Doosan Babcock and Skoda Power’s marketing activities.